Do you remember the days, when soup came in cans and we had a choice of Cream of Tomato, Cream of of Mushroom and Cream of Chicken! Then there was the packets of chicken noodle soup that you added to cold water and heated up on the stove. You can buy wonderful ready made soups these days, but with everything ready made there follows the list of E’s and other preservatives and quite often extra sugar and salt, so I usually make my own soups, it isn’t hard it just takes a bit of prepping that’s all, but it is well worth the effort. 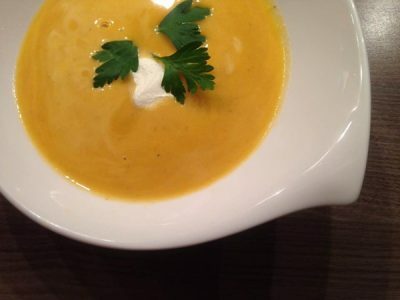 This creamy carrot and ginger soup is a go to winter warmer in our house, it’s cheap and so easy to make, not only that it is delicious and healthy! In a large pot over a medium high heat, melt the butter and add the onions and cook until onions are starting to go transparent and glossy then add the garlic for a few minutes. Add the stock, carrots, and ginger, cover and bring to the boil. Then reduce the heat to a simmer until carrots are tender. Remove from the heat and transfer to a blender or use a hand blender. If using a blender then don’t fill it more than half way and do it in batches if you have to. Be careful when blending hot liquids as the mixture can spurt out of the blender. Pulse the blender to start it and then puree until smooth. Return to the pan and add cream, stir over high heat until hot. Pour into bowls and garnish with dollop of sour cream and a little sprig of parsley.